In what is almost certainly a cunning heist gone wrong, the FBI discovered a not-so-hidden tunnel leading straight to a bank. 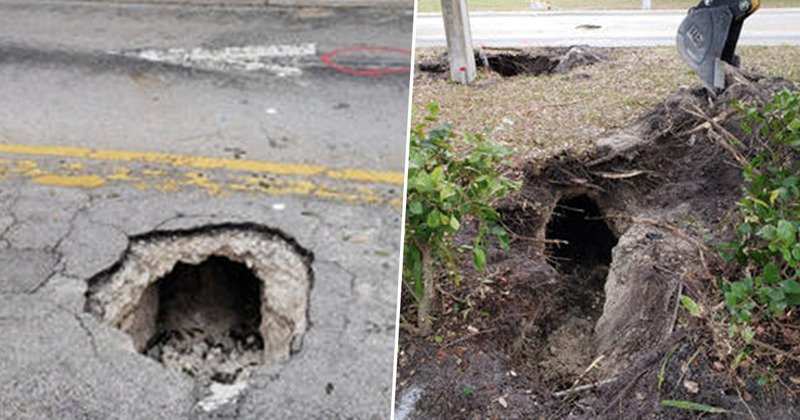 The supposedly secret passageway was discovered under a road in Pembroke Pines, Florida, yesterday (January 30) after a work crew responded to a report of what appeared to be a sinkhole in the ground. When the crew peered into the hole, they noticed a power cord running towards the nearby woods – their first clue that the hole was more than what it seemed on the surface. According to NBC Miami, FBI Special Agent Michael Leverock explained FBI and police came to the scene to investigate and found the entrance to the tunnel located in the wooded area. They learned the tunnel ran for 50 yards, running under the road and ending close to a nearby Chase bank – though it didn’t actually reach all the way inside, which in my opinion kind of defeats the purpose of tunneling. It’s all well and good approaching the bank by tunnel, but if you then just pop up outside and walk through the front door, it kind of takes away the element of surprise. A winch and a small generator were found near the hole, as well as a wagon which investigators presume was used to transport the dirt and rock from the passageway, Associated Press report. It sounds like something out of an episode of Looney Tunes. I can almost imagine this criminal mastermind plotting their heist after being inspired by a thief dressed in black and white stripes, carrying a sack emblazoned with a dollar sign. We don’t know who is behind this at this time, they could have been here a week ago, last night, we don’t know at this time but it is an extensive hole. Usually you use equipment to do that, these people were using pickaxes and a small little wagon…this is truly a unique case here. Whoever it was, they were obviously very confident in their plot if they were willing to spend their days tunnelling through the dirt to complete it. The Special Agent described the tunnel as ‘very claustrophobic’, explaining it was located a couple of feet below the ground and only measured two or three feet in diameter. I would like to say I saw something like this in movies however this hole is so small, it’s unique. I don’t know how they did it, I would like to put it into words for you, but it is so cramped in there. It’s a puzzle, I can’t imagine how they did it. The FBI agent suspects recent heavy rain may have caused the tunnel to collapse, and NBC Miami report a Palm Beach County Sheriff’s Office cadaver dog was sent in to search the tunnel, but no one was found inside. Despite the effort which went into creating their supposed approach and escape route, the mastermind behind it never made it into the bank. Leverock drew the case up as an attempted burglary, but the FBI is urging anyone with information to contact its Miami division at 754-703-2000. It’s certainly a curious case!